Woodgroove offers unique and personalized products that are designed by you and crafted by them which gives you a gift that is truly one of a kind. They specialize in laser engraving and maintain their high quality standards by producing their products one at a time. They offer Laser Engraved Growth Charts, Personalized Wooden Blocks, Laser Engraved Letter Plaques and Chinese Zodiac and Chinese Characters. I love that each one is different and tailored to suit your preference. 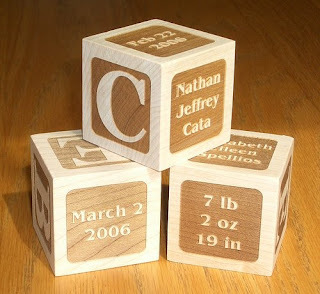 The Wooden Blocks are laser engraved and you can personalize all six sides of the block with anything! Some ideas here are your baby’s birth information, favourite short quotes, and inspirational thoughts. If I were to get one, I think I would choose six of my favourite short quotes. It would look great on a shelf on display in my living room. What a great gift idea too! Woodgroove has offered one of my readers a chance to win an e-coupon for a free Personalized Wooden Block ($29 value) to use at their website. Please note that the winner will be responsible for the shipping costs which are around $5.